This collection of unabridged readings chronicles the lives of people striving to survive as aliens rule Earth. In James Van Pelt's "How Music Begins," a junior high school band director struggles to keep the band members' spirits up after they've been shanghaied, by unknown and unseen aliens, and confined to a dormitory and practice auditorium. In "Okanoggan Falls," by Carolyn Ives Gilman, a housewife subtly resists the forcible relocation of her townspeople by an alien military captain. Finally, in order to stay alive, a woman must make dogs act correctly for aliens in "Laws of Survival" by Nancy Kress. Read by Vanessa Hart and Tom Dheere. 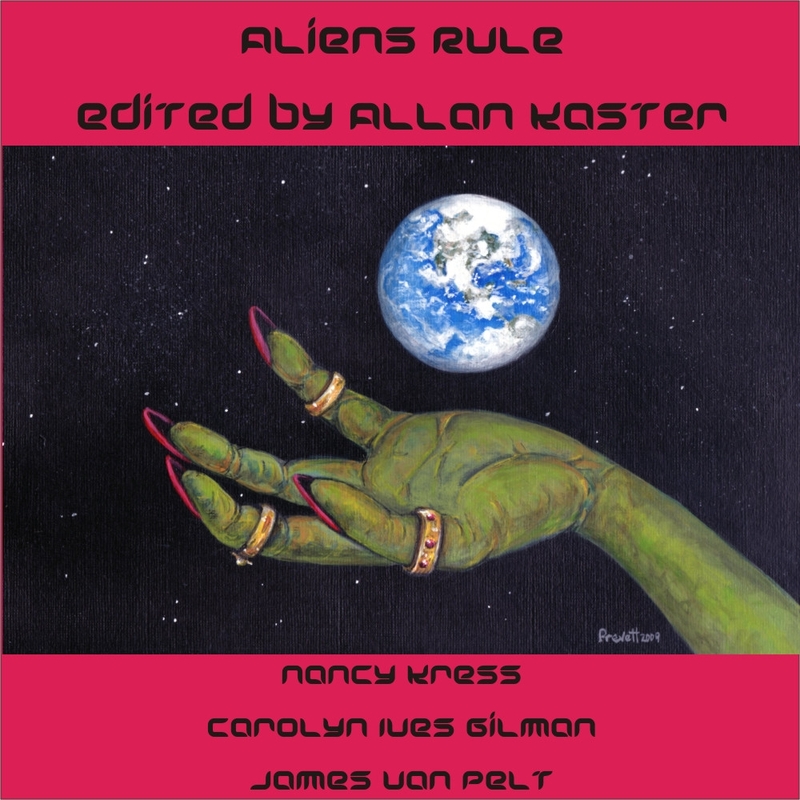 Aliens Rule, an audiobook from Infinivox, edited by Allan Kaster, consists of three unabridged novellas and/or novellettes: "How Music Begins" by James Van Pelt; "Trouble Comes to Okanoggan Falls" by Carolyn Ives Gilman and "Laws of Survival" by Nancy Kress. As indicated by the title of the CD, the stories all revolve around the theme of people coping with an alien invasion. All three stories were previously published in print editions in magazines such as Asimov's and Fantasy & Science Fiction. In "How Music Begins", a junior high school band must cope with having been abducted by unseen aliens and trapped in a dormitory and practice auditorium. I first encountered this story by James Van Pelt when it appeared in print in Asimov's Science Fiction Magazine. I was curious about whether the story would affect me in the same way in audio version as it had in print, since format and medium can change the impression a story makes. For instance, when I attended Anticipation, the Montreal Worldcon, Nancy Kress gave a reading of her short story "Deadly Sins", which later appeared that fall in Asimov's October/November 2009 issue. Aside from thinking "why is this story familiar? Asimov's only publishes new fiction" until I realized that I'd been to a reading of the story, I found my impression of the story to be quite different than the one I had had while listening to it being read. Nancy Kress read the story in a fairly light breezy tone of voice and I found it quite amusing. Reading it in print without listening to Kress's vocal inflections left me feeling that the story was in fact quite dark and cynical. So it was with great interest that I listened to Tom Dheere read Van Pelt's story because I wanted to see whether the different medium altered my impression and experience of the story. In this instance it did not. Both in reading and listening to the story, the author drops clues as to what the situation is and exactly how long the students have been trapped in it. The sense of gradual build up and discovery of what was going on was not altered by the medium. I felt it was a rather sad story in print and felt the same was after listening to the audio version. In "Trouble Comes to Okanoggan Falls", Carolyn Ives Gilman tells the story of a small town that tries to prevent its destruction via strip mining by the alien race who have conquered the Earth. The story is beautifully read by Vanessa Hart. Life in sleepy, bucolic Okanogan Falls has not been changed much by the conquest of Earth, at least not until a division of the alien occupation army shows up to inform the townspeople that they all have to move because their town and two others are going to be strip-mined. The protagonist's husband is the town's mayor. He convinces the alien commander to given the town more time, putting off the destruction of the town for several months. In the mean time, he and his wife decide that they will try to win over the commander with kindness, inviting him to dinner and showing him what life in the town is like in an effort to change his mind. Both sides are changed quite a bit by the experience. The final story of the of CD, "Laws of Survival" by Nancy Kress, is also read by Vanessa Hart. In this story, the Earth had already ruined itself via warfare and environmental problems before the alien ships landed. People with means and money live in sealed off cities while people like the protagonist survive by combing the garbage extruded by the cities. The aliens live in their domed ships and no one has seen them. Then one day the protagonist finds a puppy in the garbage and a door opens up and a robot comes out and trades her fresh food for the puppy. This gives the narrator an idea and she trades some of the food for the dog of a fellow shantytown dweller and goes to the alien ship to trade for more food. Instead the robot seizes both her and the dog and pulls them into the ship. From there things get complicated as the ship commands her to train the dogs it had collected to its specifications. The story does a nice slow reveal of both the protagonist's life before occupation and the reason why the ship wants trained dogs. Each story in Aliens Rule is quite riveting, so it is unlikely that the listeners mind will wander while listening to the three CDs - or at least mine did not, which is something that often happens when I listen to music. In short, Aliens Rule is a collection of well-chosen, well-read stories.